We have released a new extension for Google Chrome, TwitterWatch! TwitterWatch helps you keep watch on hot Twitter keywords. It is extremely easy to use - search a keyword and it will show you the latest updates in real time. TwitterWatch uses very little resources (update quotas) and can coexist with other Twitter clients. <- Type to search the latest tweet on a topic. TwitterWatch automatically refreshes your search and show the number of updates next to the extension icon. If you are interested, grab it now and have a try! 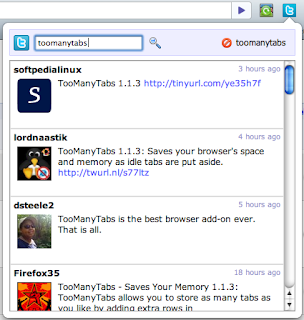 We have two other popular Chrome extensions - TooManyTabs for Chrome and FreshStart Session Manager. Welcome to try! Great extension, just installed it, thank you! I only wish it would auto-refresh automatically (without having to click "Search" icon again) .. Is it possible? Thanks again. TwitterWatch automatically refreshes the search in background, but in the current version you need to re-open the TwitterWatch window to see the new tweets. We will consider adding auto update in the future, thanks! That would be cool. I very much like the way Twitter is updated on the Web - it just updates the page itself and one only needs to click the yellow path. Why I don't seem to understand the conversation? I get automatic updates from the addon. Whenever there's updates a small counter will appear and I don't need to click search icon again to get updates. Or am I missing something? Yep that's right, when the counter appears, clicking the TwitterWatch icon will update the content automatically. I think Evgeny is refering to the auto-refresh when the popup is kept open, right?